Note: This can be one of the last expeditions… we hope it is not but the people of Papua have been being civilized and so they are disappearing this way. Day 3: Early morning departure with a small missionary plane to a lowland jungle. We hire porters and trek to the first Tree People village. Then spend the night in the village. Day 4 – 10: Trekking across the territories of Korowai and Kombai tribes. 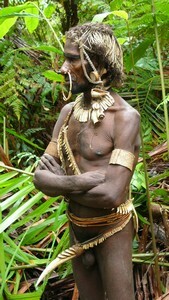 We observe the life and work of the Tree People of Kombai tribe":[Korowa­i_Kombai.html]. Day 11: Departure with a hired plane to Wamena – Baliem valley. Day 12: Wamena sightseeing, local marketplace and visit of Lani tribe (short show). Day 13: Visit of Dani tribe villages: Mummy in Jiwica, making fire, pig roasting, fascinating battle reconstruction, dances, songs, trip to a salt lake and the observation of how salt is “mined” using stems of banana palms. Day 14: Departure by plane for Sentani (Jayapura) the capital of Indonesian province Papua. Sightseeing and shopping of souvenirs at the Hamadi market. Day 15: Departure for Jakarta – participants who have connecting flights leave, the others spend the night in Jakarta and leave the following day. OPTIONALLY: There is the possibility to extend the stay for diving in the north of Sulawesi (Manado-Bunaken Island and Lembeh Strait are some of the best places in the world to dive. Even National Geographic has reported on Lembeh Strait – 11/2005). 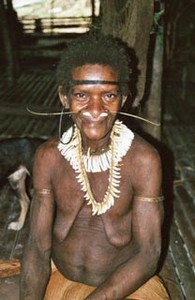 It is also possible to dive directly in the western part of Papua, which is perhaps the best diving place in the world. It has got this name because of its beautiful variety of coral reefs, the quantity and variety of fish species, and the multitude of other sea animals, including 8 species of pygmy sea horses. A week long visit comes with a guarantee of Manatee observation – a fantastic experience. Please contact us for further information. For our clients, we organize diving trips for the standard prices of the local dive shops. We recommend only the really good, and well-tried ones. All accommodation in local mid-range quality hotels (during the trek in huts of the aborigines or in your tents), all inland transportation, air transportation from and to Wamena, two flights by a small hired plane, a possible boating trip in gouged boats made by aborigines, an English speaking guide with a very good knowledge of the local environment, and where needed also a local guide. The price also includes safety expedition equipment: satellite navigational GPS system and a satellite phone. Our clients can use the satellite telephone for private calls (note that this requires your guide’s consent). The flight ticket to Asia (Jakarta) and back,the flight ticket from Jakarta to the Papua province Indonesia (Jayapura – Sentani) and back to Jakarta, food, entrance fees to attractions, and additional fees for taking photos and filming, porters needed during the treking.